Well, we survived the big snowstorm this weekend, and despite all the hype we barely got a foot of snow. 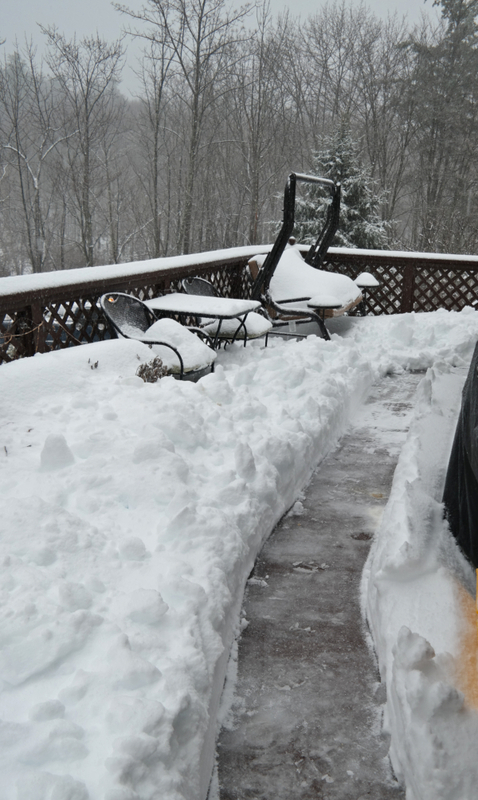 I'm not complaining, believe me....this foot of snow was HEAVY and an absolute nightmare to shovel. But shovel I did, because how else would I get to my feeders to make sure my little birdies were taken care of? Poor things, I feel awfully sorry for them in this weather. 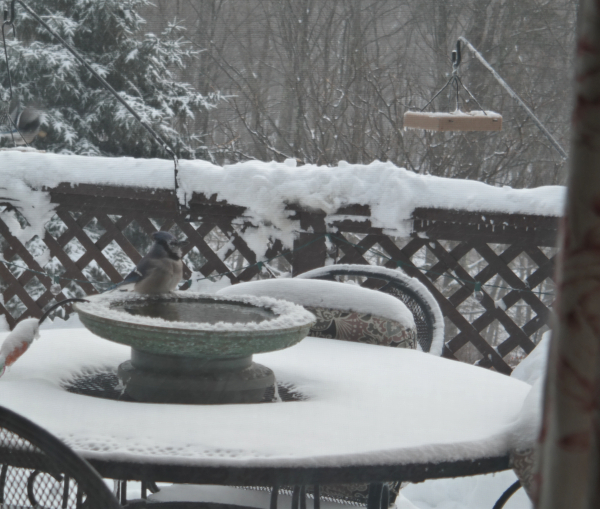 Look at this poor little blue jay...he had all his feathers fluffed up to keep warm, he looked like such a fat little guy! Which of course he very well could be, since I take such good care of my critters. My birdbath gets a lot of traffic in winter - I have to fill it about every other day. I have a great heater for it, it's this farm heater which I ordered from Amazon last year. I had a different type before, but it seemed to last only a season or two before dying....this one's doing well so far, fingers crossed it will stick around for a long time. 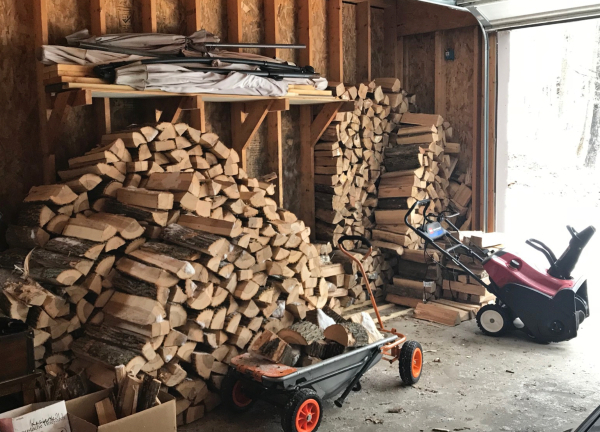 I prepared for the winter storm by ordering another cord of firewood, and my daughter and I spent a couple of hours on Saturday morning getting it all stacked in the garage. 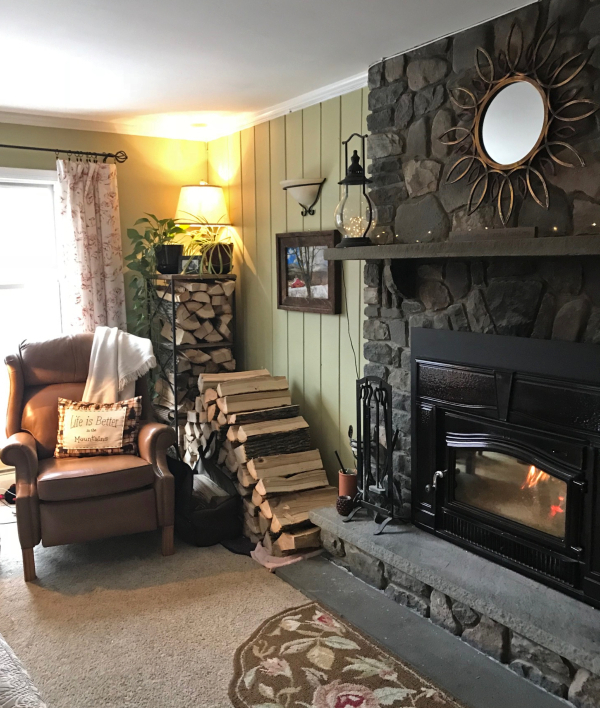 We made room next to the fireplace for an extra load of wood so we wouldn't have to keep going out in the storm, or the frigid days afterwards. I also changed out the bedding in my room, to my warmest flannel duvet cover and matching sheet set from LL Bean. I've had this set for years, but kind of forgot about it until recently. I had to abandon it for a while when I was going through my awful hot flashes, I couldn't stand the extra warmth at all. I tucked it away in a closet and completely forgot about it until I was making up beds for my Christmas visitors. This bedding is so soft, the only problem is I don't want to get out of bed in the mornings! Once I close my drapes it's like a cozy little cave in my bedroom. My sanctuary. This was what my weather app said when I woke up this morning. Do you know how extremely difficult it was to climb out of my cozy warm bed? 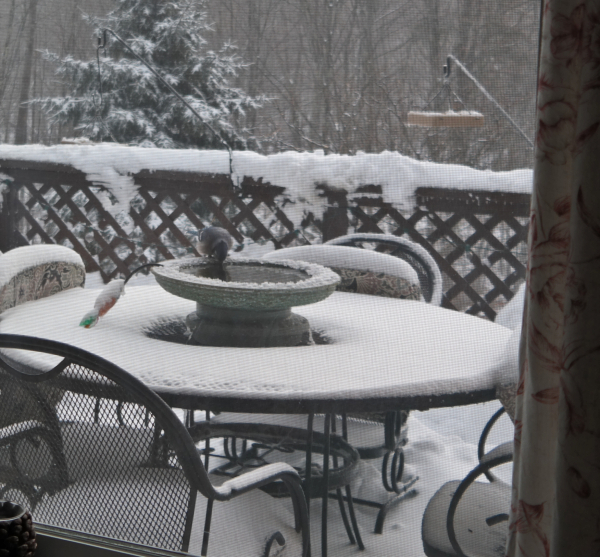 Not to mention going out to feed my birds.....brrrrrrrrr!! My wood stove did a fantastic job of keeping the house warm, though - best investment I made in my house by far! The sun came out for about a millisecond this morning....not enough time to warm up our frigid world, but just enough to make me smile on a Monday morning. 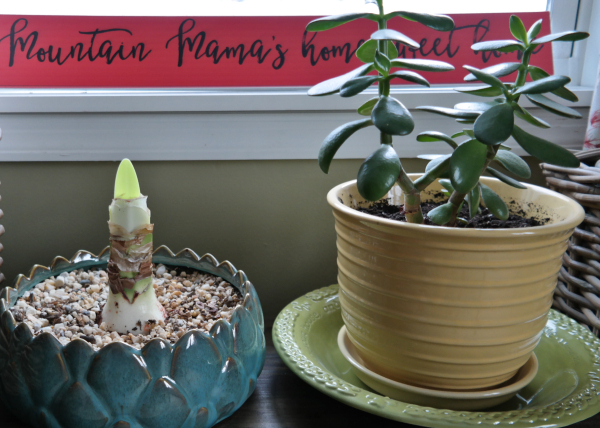 I finally remembered to pull my mom's Amaryllis out of the downstairs closet where I'm overwintering my Fig tree. I brought it up on Thursday, cleaned it up a bit, gave it some water, and put it in the dining room window. I was delighted to see it's already sprouting this morning, just 4 days later! Isn't an Amaryllis a remarkable thing? On a frigid winter's day such as this I will enjoy every single tiny little spark of spring hope that I can. When the Amaryllis is done blooming I have some spring bulbs in the downstairs fridge I'll try to force. But for now I'll just settle in next to the fire in the evenings, and enjoy my cozy nights at home. How was the storm in your area? Are you experiencing this awful cold front also? So glad your home is so toasty warm, the snow is pretty to look at, I just don't want to live in it anymore. I can't blame you, Marty, but I'm not sure my Irish skin could handle your summers either! Even on the weekends I don't get to sleep in, Jenn - it's frustrating!! 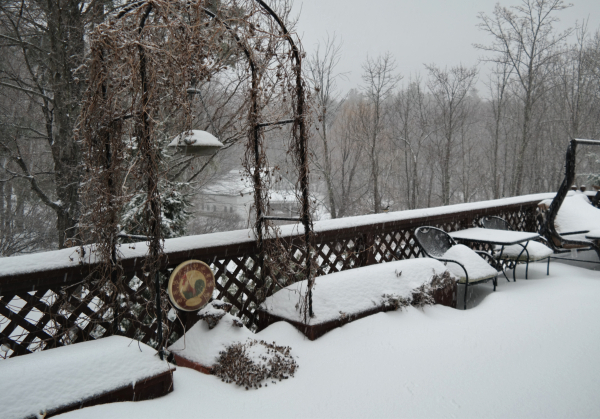 Lovely photos from your neck of the woods, Debbie! 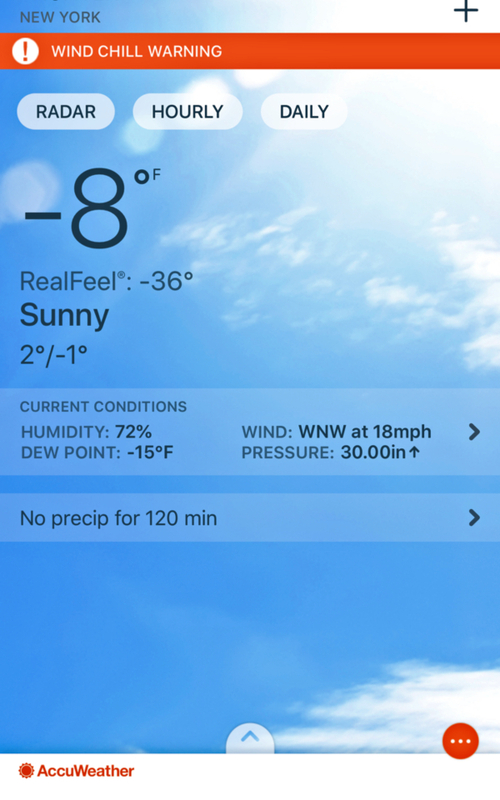 Very cold here, too, with a foot of snow. I'm hibernating. I wish I could also, believe me, Linda! Brrrrr! You are colder than me. We hit the low of 12 this morning with no snow. Now they are predicting freezing rain on Wednesday. That's what's outside my window right now, Penny! It has been in the 50s around here but this morning it was in the 20’s!!!! No snow though. I would love some flannel sheets on my bed but husband says no. Haha. I cant wait til spring. How could anyone say no to flannel? It's the best, Lisa!! That Amaryllis is in the most beautiful pot. You'll have to share when it blooms. Your place looks so nice and cozy, so it looks like you're all set. Stay warm and safe. 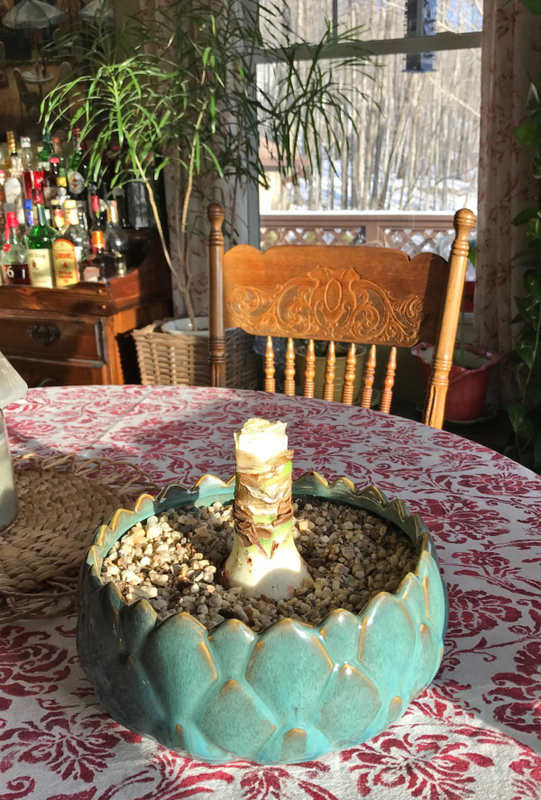 I bought that pot and amaryllis for my mom from a local garden center that I adore, PJ - her birthday is in November and last winter she and my dad were sticking around for the winter since he wasn't well enough to travel....I figured it would give her something sunny to look at. and it's been frigid here in CT too - 2 degrees yesterday, 8 degrees right now. My horse paddocks were a skating rink until the guys standed them. Supposed to be in the 40's tomorrow - strange weather. We didn't get much snow though. Just an inch - a dusting. Really weird weather, Karen Ann - tomorrow we'll be up to 48, they predict, and then back down to frigid by the weekend!! Girl it was old down here too. seriously i can't stand it! I just sit inside and do absolutely nothing lol! No storm for us. Just stupid cold! You're cozy home always knocks off the chill! I'm so blessed, no doubt, Mountain Sister! I do love me a good dose of cozy!! Makes me tired just to look at that path you had to shovel! I have an amaryllis that is making progress too. Love those gorgeous big blooms. It was 12 degrees here yesterday morning, today it is 21. That path was awful, Carole, I'm still sore from it 3 days later! So beautiful! 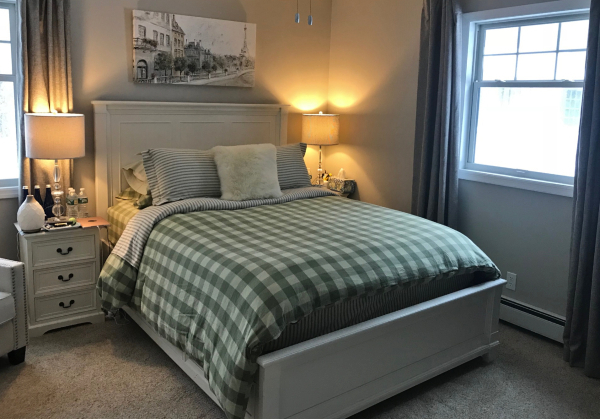 All that snow and your warm, flannel bedding...all of it! I suppose I love snow so much because I grew up in and currently live in states where snow is rare. My husband said that one winter of shoveling snow would break me of my love for it...LOL Hope your week is off to a great start! Love and hugs! He could be right, Benita - there's nothing fun about shoveling snow! I tell myself it's a free workout though!! 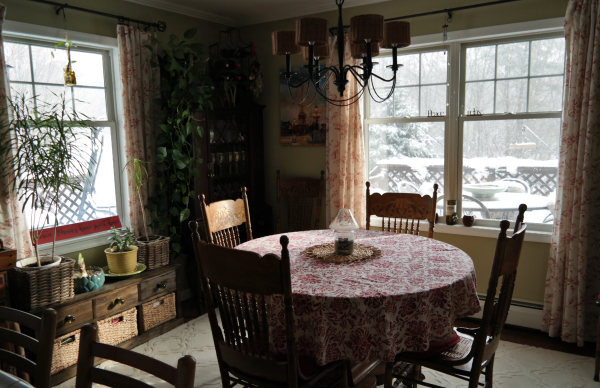 Always enjoy a glimpse into your beautiful cozy home and surrounding area. 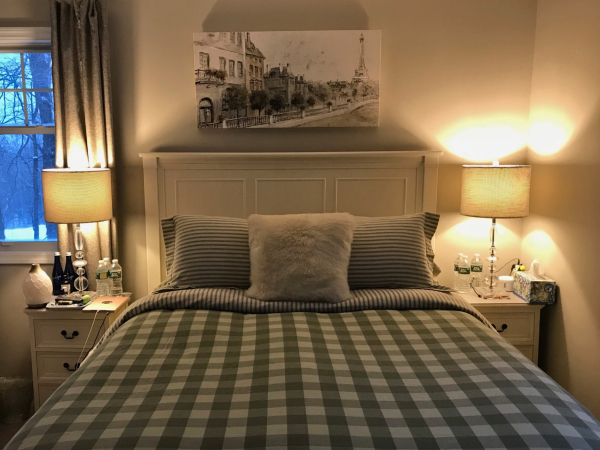 Love the flannel sheets and use them year round. I use flannel sheets about 5 months out of the year, Phyllis - these sheets are particularly cozy!! I adore that bedding! I happen to love checks. I have this warning for you about stacking the firewood inside: Never stack firewood indoors. Firewood should not be stored indoors in any area – in the home, basement, or garage. Insects can emerge to take up residence within the structure, and the firewood pile can also provide attractive harborage for rodents or other wildlife or insect pests. Thanks, Brenda - my garage isn't attached to the house, so I don't worry too much about it. We had tons of rain this last week here in Northern California. We were jarred out of bed a few very early mornings ago by a "red alert" on our phones because of flash flooding. Luckily, it wasn't intended for us, just for the poor souls next to us in Paradise. I can't wait until our house is finally done so I can have a warm, cozy house like yours! I really enjoy seeing how you decorate and just might steal an idea or two! ;) Stay warm! Steal any ideas you want to, my friend! If you need any sources, feel free to drop me a line! Deb we are getting about the same kind of weather. I love that you keep the birds happy with fresh water and food. I know they love that you take such good care. I try my best to keep my feeder full but our resident squirrel comes out of his winter sleep of his nest every time I fill it. It is a squirrel proof feeder but he some how always manages to get some. They must be like dogs and can smell that bird seed the minute I put it out. He is pretty much up in his nest all winter until he smells that bird seed being filled. Oh Nature!!!! Your house looks so cozy and warm. Enjoy that beautiful fireplace on these cold frosty days. The squirrels get our seed also, Kris - try feeding the birds safflower seed - the squirrels don't like it! I had a great squirrel proof feeder (Squirrel Buster) but the darned bear carried it off somewhere in the fall and I haven't seen any sign of it since!! So glad you are nice and warm in your home sweet home. 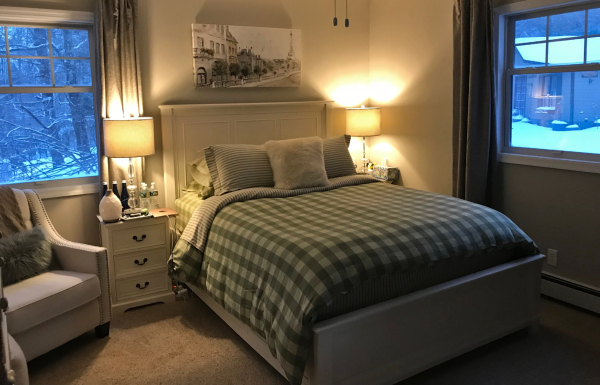 It all looks lovely and how nice to find your flannel set when you need it. It was good timing, Lorraine! 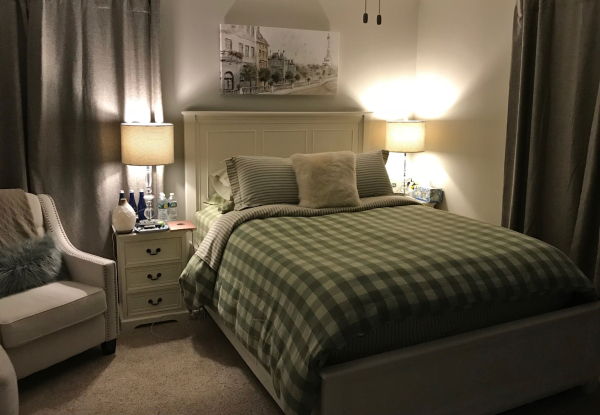 I thought I would hate the green in this bedroom, but I actually like it! The storm in NJ was a joke. When oh when will I learn the weather is never forecasted correctly. They make everyone crazy for nothing. Only thing they got right was the deep freeze on Monday. I'm thankful we didn't get as much as they predicted, Cindy - it would have been a lot harder to shovel 28 inches!! Oh I love your warm bedding! How pretty, great colors. You must be so happy you found it. Stay toasty. I had it tucked away in the bottom of the Big Green Monster, Kim - things seem to get lost in there!! Everything is a sheet of ice around here right now too, Nancy - you be careful out there! !